Younger than I'm gonna be." 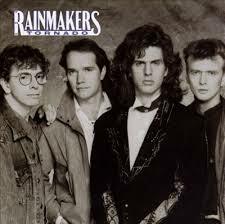 It was nearly 30 years ago when The Rainmakers (led by Bob Walkenhorst) first rocked-up the infamous Coyote Club. And Kansans are still talking about those shows. 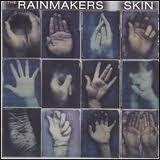 The Rainmakers bring it hard. They deliver the sweat like the FedEx man on Christmas Eve. And Bob Walkenhorst is the kool-kat who rings the bell and takes off before you can answer the door. Just back from a successful tour in Norway, Bob was applying a second coat of acoustic kickass rock-paint on the ears of some appreciative fans at the iconic Donut Whole in Wichita, KS. Even at 60, he looks and sounds every bit the raucous rocker from the 80's. Time has only made him better. After working the stage for two hours, Bob graciously joined me for a little coffee and convo. 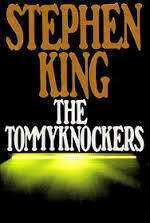 The Tommyknockers. How did you find out the scare-master was a fan of your music? 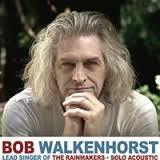 Bob Walkenhorst: Well, The Rainmakers had been touring all year and we were done touring. We were back home when they said we got this offer to go to Bangor, Maine and play a concert for Stephen King. And they asked us if we knew who Stephen King was and well yeah, everybody knows who Stephen King is. He was gonna pay us a bunch of money to come play a show, so we went up there and played a concert for him in January of 1987. I said, 'That's great. I'll believe it when I see it.' Well, his next book that came out was The Tommyknockers. We got this place of honor. And that's really nice. Now, every time I'm in a thrift store or in an airport and there happens to be a copy...I'll flip it over and, 'Yep. It's still there.' He also used some lyrics and actually mentions me by name in "Gerald's Game". So even if the records go out of print, I'll always be in the Stephen King books. Casey Chambers: That's cool. Which song did he use in that book? Casey Chambers: That is good stuff! Bob Walkenhorst: It is. It's very neat. Casey Chambers: You've had the opportunity to perform on some British TV shows like "Top of the Pops" and "The Tube". What did you take away from those experiences? Bob Walkenhorst: Oh...being on TV is not the same as playing live for people, y'know, it's kind of...it can get real cheesy if you're not careful. And "Top of the Pops" was kind of a cheesy show. It was prerecorded and you were lip-syncing anyway...so it didn't matter. Every time I see it now, I cringe because I turn to the camera and give'em a big cheesy smile and sing. But it was a great experience. I mean, I can laugh about it now because there are things that are just silly. It's still a great privilege to have been on the show. I think...wow! The Rolling Stones were on this show. The Beatles were on this show. And now I'm on this show. So it was fun. Casey Chambers: And The Tube? Bob Walkenhorst: The Tube was a live show. It was a live broadcast. Our record company hired Elton John's horn section...a horn section that we had never rehearsed with. It's going out over the air live, so you hope it works. And it did. We played really well. We flew in, went straight to the studio, rehearsed all day and then did the show. We'd been up for 60 hours or something and I look at it and think...y'know, we did damn good. We played really well. Sometimes the auto pilot kicks in and you do what you gotta do...cause you gotta do it. Casey Chambers: You've played several times at the Coyote Club (Wichita, KS) and people still talk about your performances there. Bob Walkenhorst: We were one of many, many really good bands that played The Coyote. I mean, that place had been a dance hall since the '20s or something as I understand it. And you can kind of feel it...when you're playing in a place where a lot of music has happened. A lot of lives and stories have gone on in there..and that place just had a spooky vibe to it. It was a big round stone building with high ceilings and everyone was always in a good mood there. It really didn't sound that great for rock and roll. It was echoey and ringy. But it was dark and edgy and certainly had an atmosphere. And in the back room, there were these tables that had these little secret drawers underneath them...'cause during Prohibition it was a speakeasy was what we heard. Casey Chambers: How did The Rainmakers begin working with producer Terry Manning? Bob Walkenhorst: Well, I have a daughter who's 20. She's a musician and I try to tell her about the music business. I also have young musicians coming and asking me how you get accepted in the music business. And I tell them the music business is so different than it used to be. It used to be you would make an independent record. And there were limited ways to sell it. You tried to get a major label interested in you and if you did, then they would choose the producer who "they" thought was right for you. You made the record. They lined up press. Local press in your city and national press. You got your video on MTV and you were pretty much on your way. They got radio to play you. It was this recipe. Here's how you make a successful band in the US. And there was a lot of luck to it, too. Things had to fall into place. The music and the band's recognition had to get a life of its own. They couldn't just make it out of nothing. You really had to have some hard work and a lot of luck on your side. Now at that time, if you were a new band you came in with no clout. You didn't have any say. You could be an artistic prima donna and say...Well I'm just not gonna record my songs if that's the way you're gonna go! And Terry actually was a great guy. He was a wonderful guy to work with. Uh...there's things about the sound of those records that really bothers me. You can tell it's a drum machine. It doesn't even pretend to sound like a human being, y'know? (laughs) It's like this big robotic machine, but that worked okay for some of those songs. 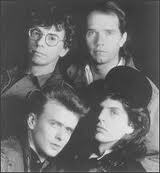 And in the context of '80s music, we were still a guitar band. Even though we were working with a producer who was building things out of a keyboard based drum machine and using some synth reinforcements and stuff...we were still a guitar band. So we did have a good record company. They worked really hard to break our band. And we had a limited amount of success. And that's where the pure chance comes into the equation. Sometimes things click. Sometimes they don't. Things happened better for us in Europe and lasted much longer in Europe. I just came back from playing a solo tour in Norway two weeks ago and I had really nice crowds every night. Casey Chambers: What do you remember most about working with Terry? Casey Chambers: A favorite of mine. Bob Walkenhorst: Yeah! I'm very proud of that song. It's a nice little piece of fiction. We're all on a raft together talking to each other. He goes, 'well ya got these three verses but for some reason it doesn't feel finished to me. The Chuck Berry verse needs one more section to it.' So I went and sat in the corner for a few minutes and came up with four more lines. Now I can't imagine the song without those last four lines. He was absolutely right. That was about the only writing change he made. He was also really good at getting guitar sounds and building these guitar textures that made one guitar sound gigantic. I mean, he really knew how to do that stuff. And, as a producer, he just knew how to make people want to record. Want to work. And have some joy doing it. We went to work at 10:00 in the morning and you worked til 10:00 at night. There was a work ethic. No drugs. No booze. We'd take a lunch break. And if things were bogging down we played ping pong for awhile. But I mean...it was time to work. And I liked to work. So Terry and I hit it off pretty easily. Casey Chambers: There's a loose, off the chain energy that emanates from The Rainmakers on stage. Rich Ruth (bass), Steve Phillips (guitar), Pat Tomek (drums)...you guys seem to instinctively know just how far to go. That's a trust thing, right? Bob Walkenhorst: There's that. There's the musical thing that your band mates bring. But then there's the personal chemistry. 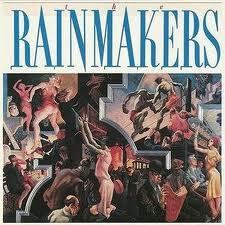 To me, Rich Ruth is The Rainmakers. Y'know he's the bass player who never sings lead. But he's the heart and the soul of the band. He brings the attitude. And if you're trying to be a rock and roll band...attitude is everything. Steve Phillips is an outstanding guitar player. He's like Pete Townshend...he could cover the whole thing. You didn't need two guitars all the time. Sometimes one guitar is enough. And Pat Tomek is as solid a drummer as you're ever gonna work with. I was really lucky to be in a band with those guys. We were a good band. The Rainmakers are still playing together. Steve's in a different band now. But my long time friend Jeff Porter is covering guitar and we're having a great time. Casey Chambers: Sweet! Jumping ahead to the late '90s, you had the opportunity to collaborate with Brewer and Shipley. How did that come about? Bob Walkenhorst: (laughs) Um...I'm not a pot smoker. We'll start with that. But the organization...NORML ...put out a compilation album ("Hempilation, Vol. 2: Free The Weed") to raise funds for their legal fights to change marijuana laws, which I can get behind. And more states are going that way. Now Brewer and Shipley are Missouri guys too and we worshiped the ground they walked on. And we had the same manager. He suggested we do it and have Brewer and Shipley sing it with us. And so we worked out an arrangement. Now the irony is...none of us were ever in the same room at the same time. We did our track and our vocals and left space for Brewer and Shipley. Brewer comes in later and does his part. Then they sent the tapes off somewhere else for Shipley to do his part. So we were never all there. But since then, we've done several shows together. In fact, I'm doing two shows with them in the next few months. Bob Walkenhorst: Yeah! I don't know if you know the history of those guys but they're a great duo. Good songwriters. Killer singers. And y'know they're like 70 years old now, or nearly. And still playing music. Whenever they play, people cry. They have been the soundtrack to a lot of people's lives. Mine included. Casey Chambers: What album changed your life? 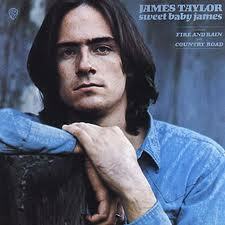 Bob Walkenhorst: James Taylor's second album... "Sweet Baby James" (1970). It was a really simple record but it had this depth and emotional credibility to it. He was pretty young at the time and the guitar parts were simple but cool. And I thought I could do that. I learned how to play all those songs. That was the record, I think, that made me say...'Get to work. You can do this.' And still, to this day...it's a great record. Casey Chambers: Yeah I like it too. Bob Walkenhorst: You know that one? Bob & Casey (together): "Fire and Rain". Casey Chambers: Yeah and there's another one I really like...a deeper cut...called "Anywhere Like Heaven." Bob Walkenhorst: Yeah! Beautiful. There was...at one point...I knew how to play the entire album. (laughs) And chicks dug that. If a guy could play that then he's...yeah, you were in. Casey Chambers: Earlier, we talked about your insanely catchy rock-rooster..."Downstream". How did The Rainmakers..."the crowd ain't going home until you play it"....signature feel-good sweat-fest......."Let My People Go-Go" come about? But it's not stupid. Little Richard and Jerry Lee Lewis and Elvis, too...those early rock and roll pioneers were literally torn between rock & roll and gospel. And is rock and roll the devil's music? They'd go one way; then they'd go the other. Jerry Lee decided he could only play gospel music, well, for awhile. Little Richard, he'd be on again, off again trying to reform. And so the song, in a very fun way addresses that subject. So I'm kind of mixing Bible stories with old rock & roll songs. I think God would say, 'I didn't really put you here to suffer. I put you here to love one another and have a good time.' That's kind of what Jesus said anyway. So...I'm just making it danceable. 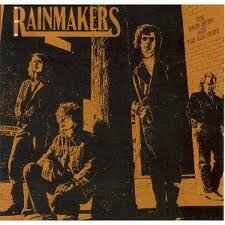 Casey Chambers: In 2011, The Rainmakers were inducted into the Kansas Music Hall of Fame. That must have been a thrill. Bob Walkenhorst: It is! Y'know, L.A and New York get all the attention for being the media centers. Chicago too. But some of the best American music is coming out of the far-flung places. A lot of great music is coming out of the middle part of the country. So for Kansas to acknowledge some of these grass roots people in their Music Hall of Fame...and to be included in that company is a great honor. And it's a nice thing to be a part of. Casey Chambers: What stands out in your memory the most about that night? Bob Walkenhorst: I remember the camaraderie. I saw people who I remember playing in bars 30 years ago. I got to see a lot of people together that night. I'm trying to remember this guy's name...Johnny Isom, I think. He used to work at Big Dudes and he'd sell ya guitar strings. Well, he was part of one of the bands being inducted. And he got up and sang, "When a Man Loves a Woman"...which is a song I have heard too damn many times...And he NAILED it! I was like, 'Oh my God! Johnny, way to go!' That was just one of the moments where I was like...'Yeah! We're all still playing music and we've gotten better with age.' It just makes you happy. Casey Chambers: I really enjoyed talking with you this evening. Thank you for your time. Good show tonight! Bob Walkenhorst: Thank you, Casey. It was nice meeting you.